Spring has not quite sprung in our neck of the woods (Sunday’s temperature is expected to drop again into the 30s), but the itch to begin gardening is transforming life at the farm. 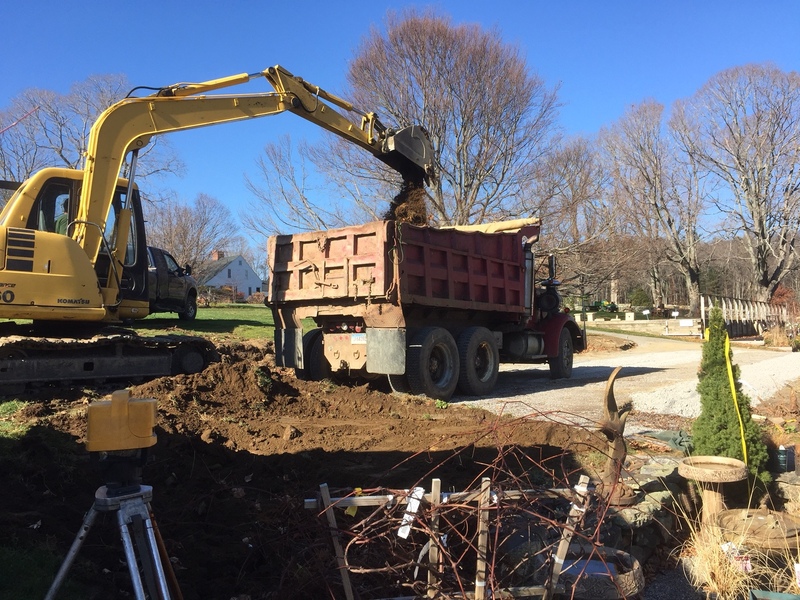 Our garden crew once again is working outdoors, clearing the grounds of fallen leaves and twigs, and preparing for new plantings. 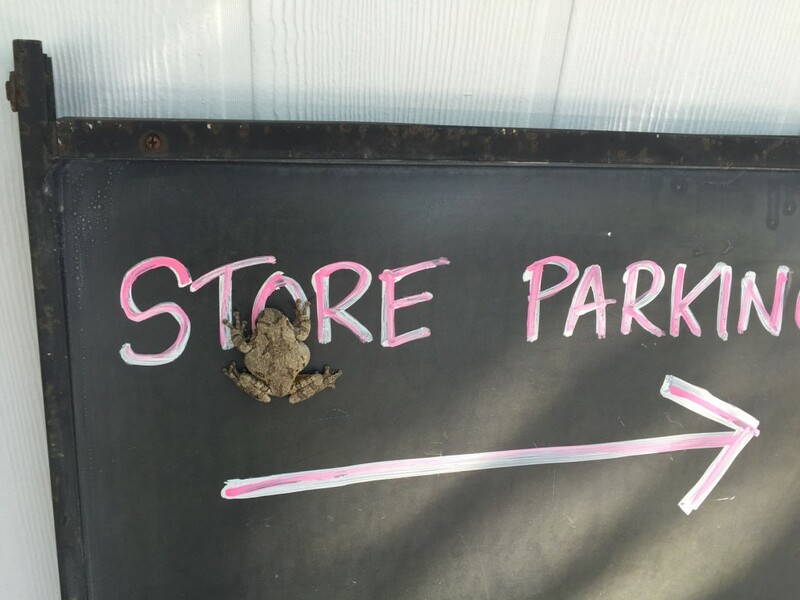 As we wait patiently for the emergence of Daffodils and other early spring flowers, the surest sign of spring’s arrival for now is that the White Flower Farm Store has flung open its doors for the season. This handsome chap is waiting to greet visitors to the store. 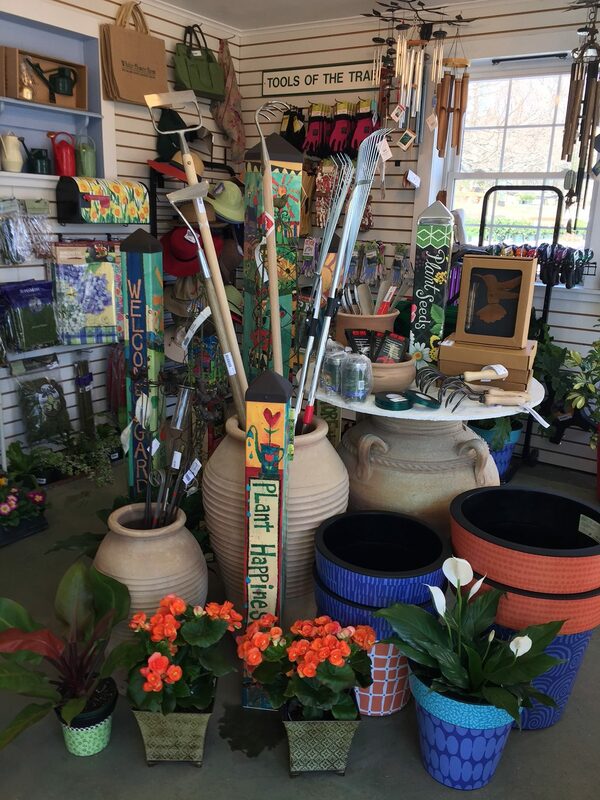 New this year are plenty of plant discoveries, hard-to-find varieties, and an exciting collection of garden accessories, tools, supplies, and gift items, including several special gift sets that are ideal for Mother’s Day. We’re stocked for the season. Among the offerings are our bestselling Rough & Ready Clogs, garden hats, a lovely English Garden Apron and matching Gauntlet Gloves. 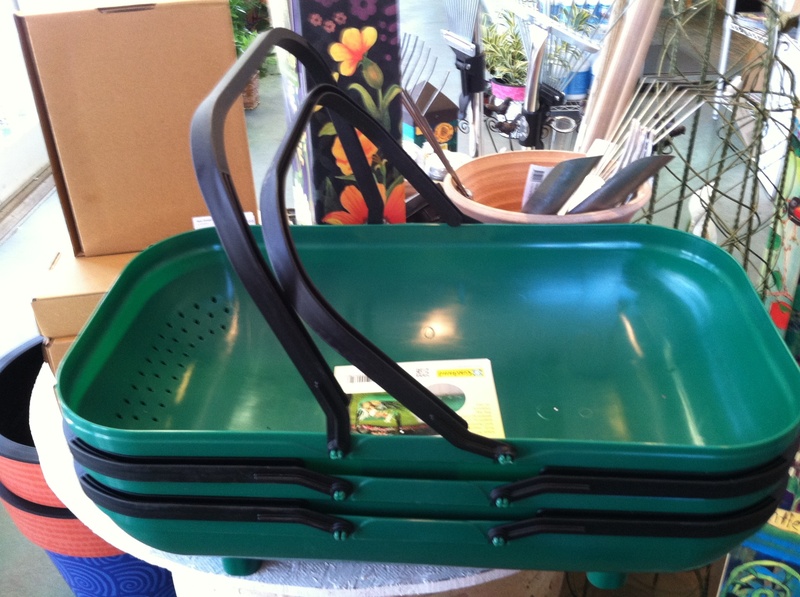 We’re particularly excited about an expanding array of gift items for gardeners and non-gardeners alike. 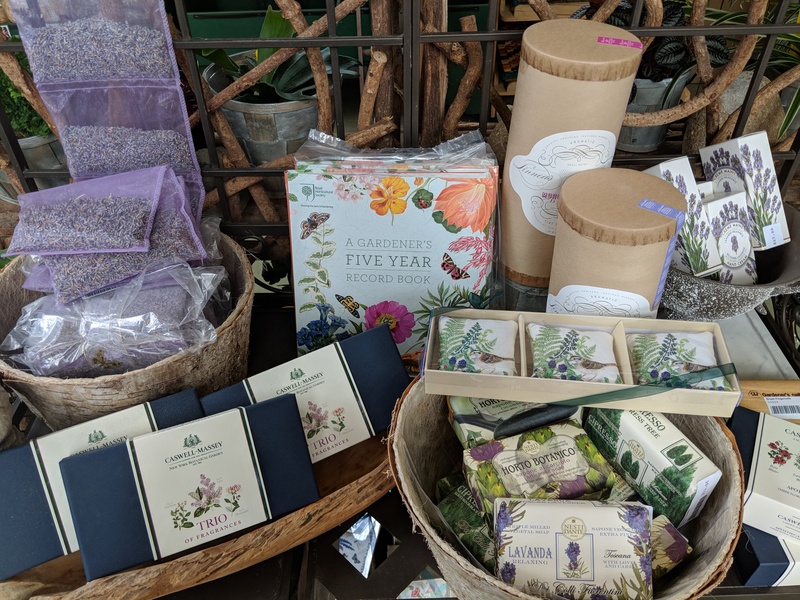 The season’s finds include Linnea’s Lights diffusers and scented candles, fragrant botanical soaps, Lavender sachets, and a deluxe Caswell-Massey soap set created for the New York Botanical Garden. 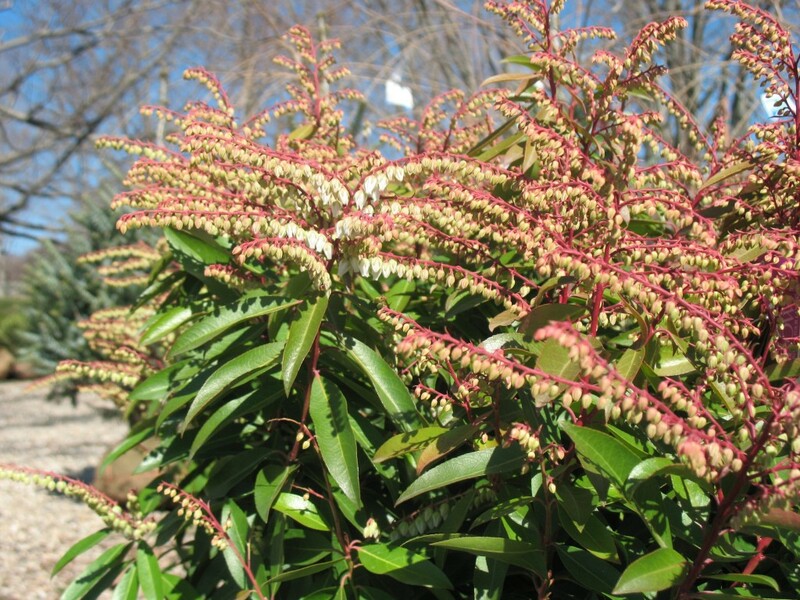 Outdoors, the store’s display areas are filling up with tree specimens, evergreens including Rhododendrons, Junipers and Chamaecyparis varieties, and a wide variety of flowering shrubs. Among the trees, we’re thrilled to be offering beautifully formed ornamental favorites from Japanese Maples and Stewartias to spring flowering Cherries and Dogwoods. 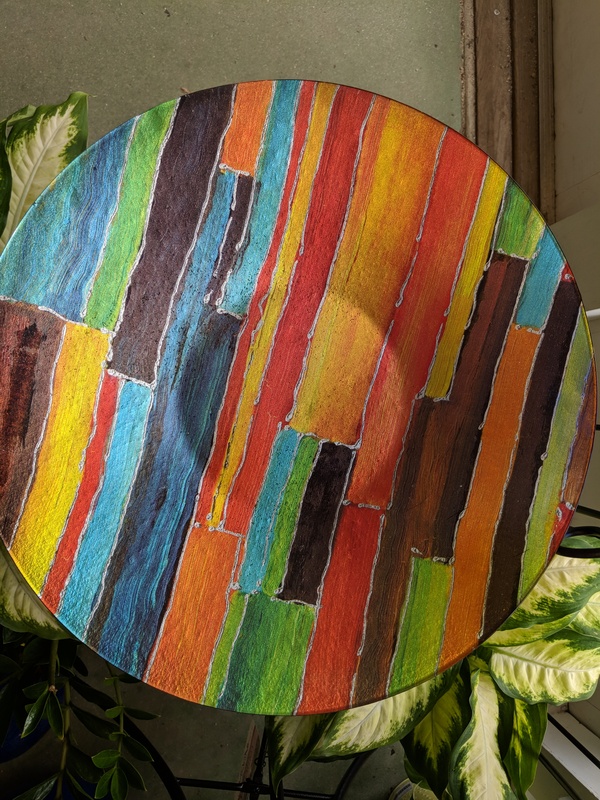 Our Murano glass birdbaths are available in an array of rich colors and patterns. Annuals and perennials both new and classic have begun to populate the yard. 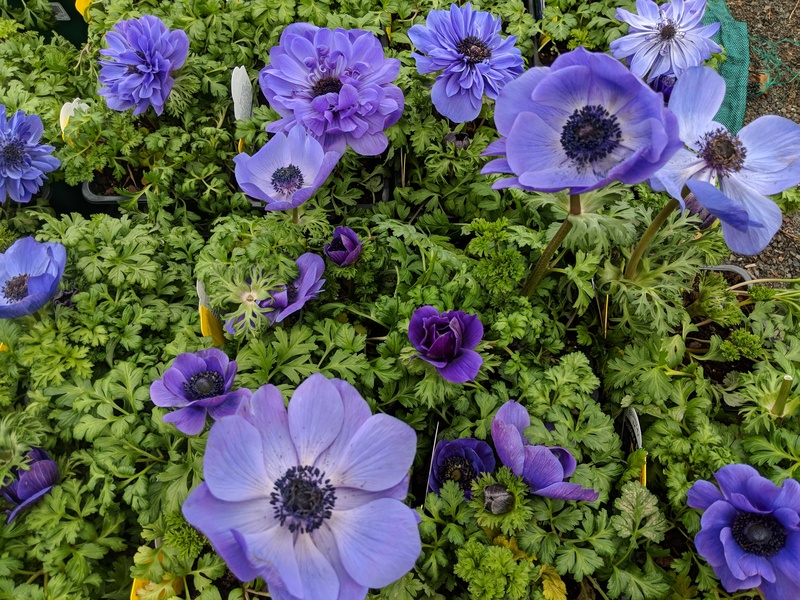 Richly colored Anemones and cheerful Pansies are blooming beautifully, waiting to be planted in containers, window boxes, and garden beds. Early flowering Anemones defy spring’s twitchy weather. The gleaming green leaves of Hellebores, some in bloom, and early flowering English Daisies are all ready to be transplanted into the spring garden. 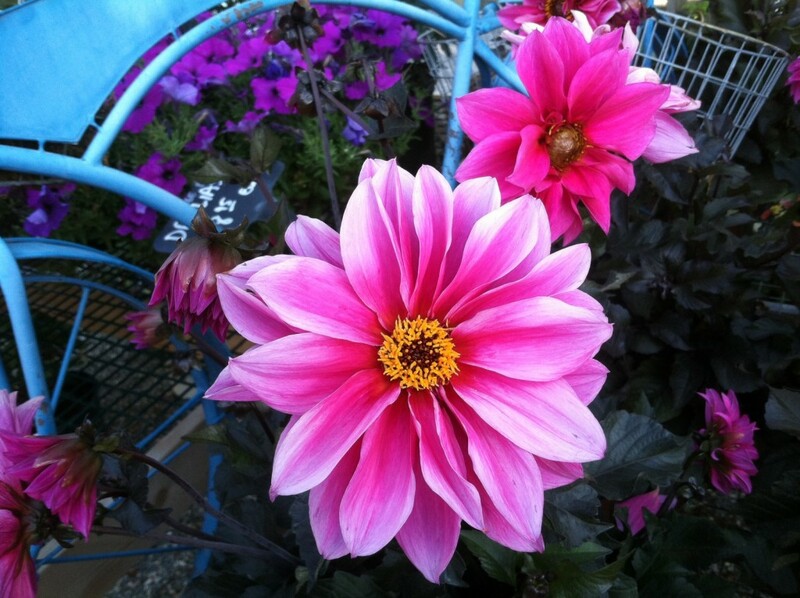 Choose from an array of Dahlia tubers, then plant them in sunny borders or in container pots. Dahlias are indispensable for adding late season color to the garden. 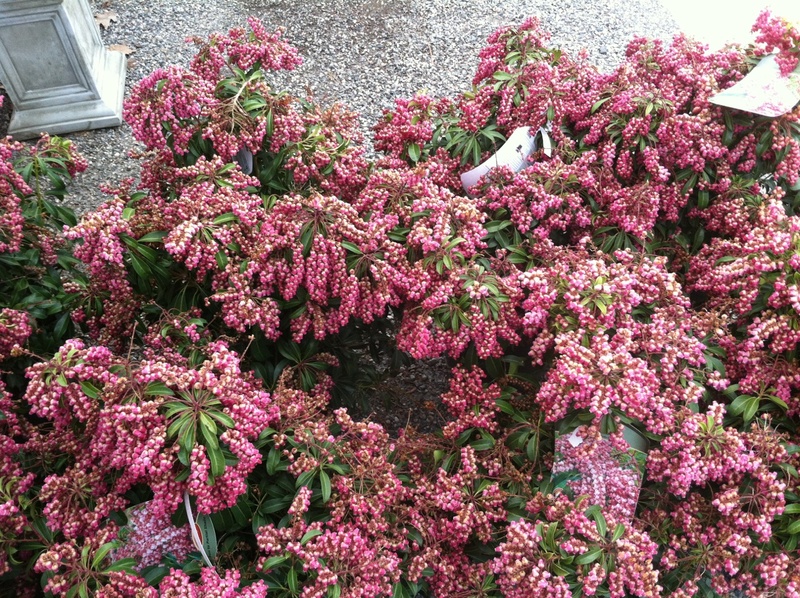 They begin flowering in high summer then keep the beautiful, colorful blossoms coming until hard frost. Inside the store, it’s plain to see the staff has outdone itself. Amid a broad selection of Dahlia tubers, Lily bulbs, and premium houseplants, you’ll find an exciting selection of accessories – from hoses and decoratively patterned kneelers to professional-grade garden tools to our new English Garden Apron and Gauntlet Gloves, Linnea’s Lights candles and diffusers, Mooni Wander Lights, soap sets and Lavender gifts, stunning and colorful Murano glass birdbaths, and Peter Rabbit miniature garden ornaments. Additionally, look for favorites such as Renee’s seed packets and mixes, small plants for terrariums and mini pots, laminated field guides, and stationery and cards. Miniature plants for terrariums are on offer along with Peter Rabbit miniature garden ornaments. The store calendar is filled with a variety of special events for the season including the popular Annual Mother’s Day Make & Take Container Event, our annual Great Tomato Celebration, a book signing with author Tovah Martin, and more. For the complete calendar, click here. 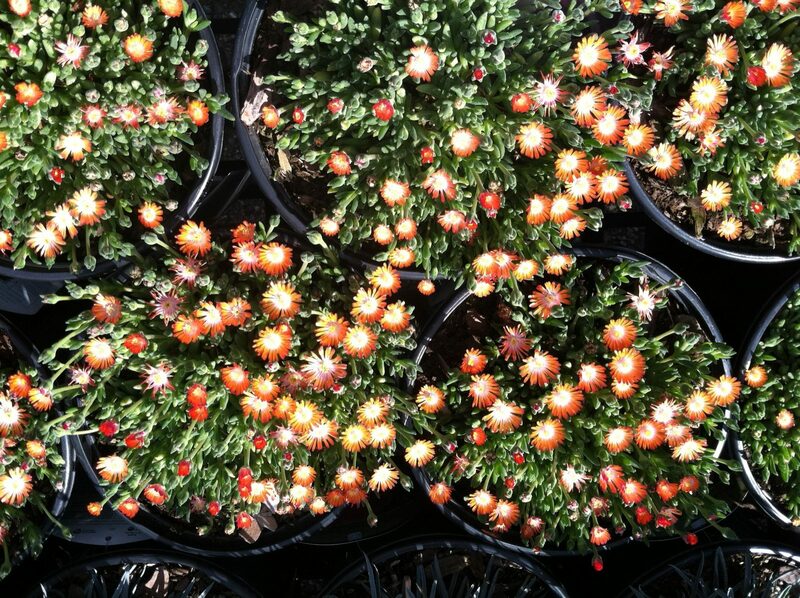 We hope you’ll visit the store often and stroll the display gardens in every season. Bring your garden questions and challenges, and show us cell phone photos of your dream gardens or of problem areas in your yard or garden. 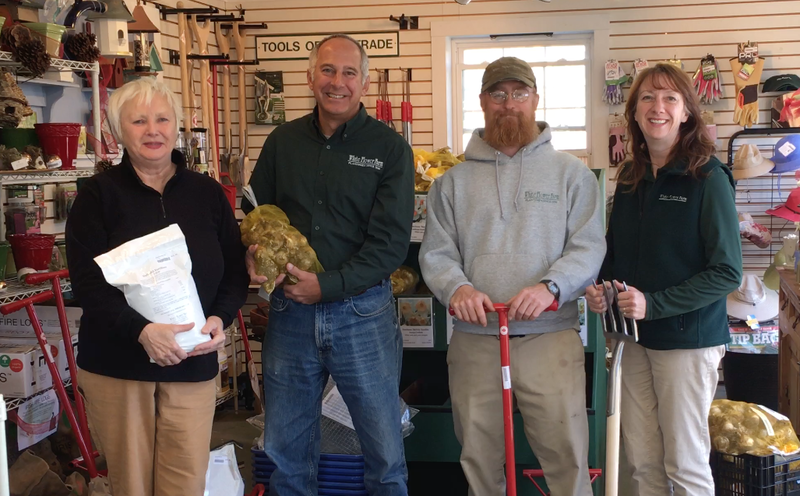 Our terrific staff, led by store manager Tom Bodnar and team leader and hard goods and visual merchandizer Mary Valente, would be delighted to help and make suggestions. While You’re Out Leaf-Peeping, Stop by the Store! Against all expectations (given the dry summer), it’s a dazzling autumn here in the northwestern hills of Connecticut. The trees are ablaze in colors of red, orange, yellow and gold. If you’re within driving distance of our retail location in Morris, we hope you’ll hop in the car, do a little leaf-peeping, stop for lunch in the Litchfield area, and while you’re in the neighborhood, visit the store. 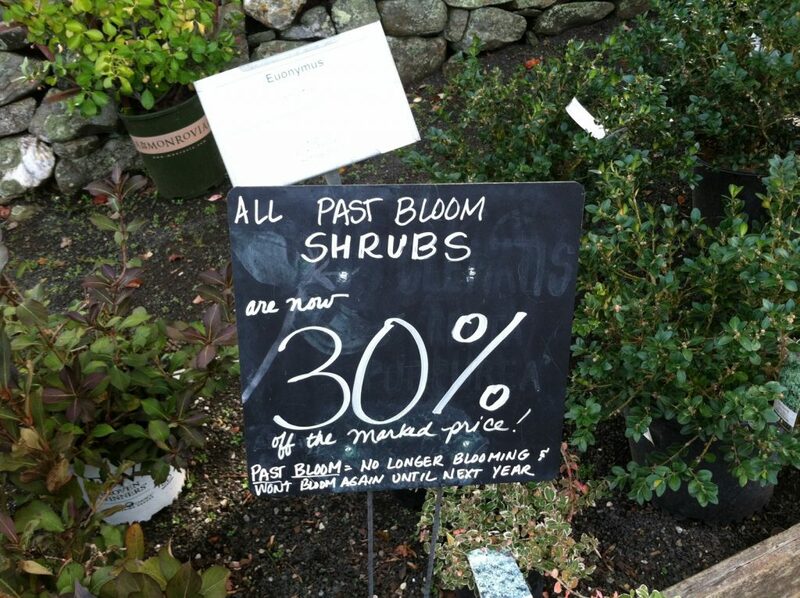 To help encourage you to visit, you’ll find all remaining perennials, shrubs and trees available at significant discounts. (It’s our way of helping them find homes before winter.) You’ll find our bestselling daffodil collection, The Works, on sale with 200 premium bulbs at 50% off (while supplies last). Inside the store, peruse the wide selection of top grade bulbs – from tulips and daffodils to alliums and hyacinths – for fall planting. You’ll also find an array of distinctive and unusual gifts – from field guides and stationery to garden tools, houseplants, and early blooming amaryllis bulbs – which will give you a head start on your holiday shopping and help you ready your home for upcoming festivities. To make bulb planting easier and more enjoyable, we offer a range of tools designed to facilitate the task. Our custom-made Bulb Planters make speedy work of digging holes. Our Ultimate Garden Fork loosens the soil in garden beds, which makes digging holes for bulbs a breeze. 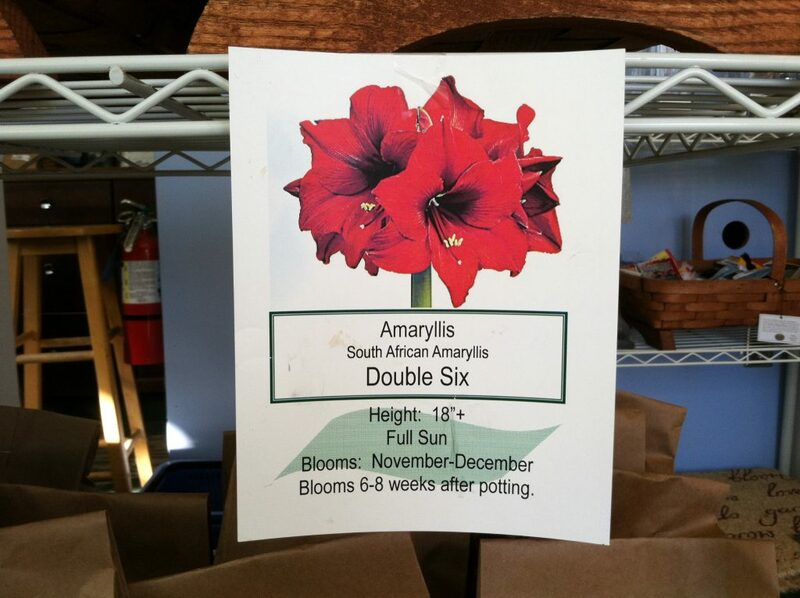 If you’d like amaryllis to be blooming in your house (or someone else’s) at holiday time, the store is stocked with South African types. These varieties are harvested ahead of their Dutch cousins, and they consequently blossom earlier in the season with most producing flowers in time for the holidays. Decorate your entry table or sideboard with festive blooms in colors of red, red-and-white, white, and pink. Visit soon for the best selection. 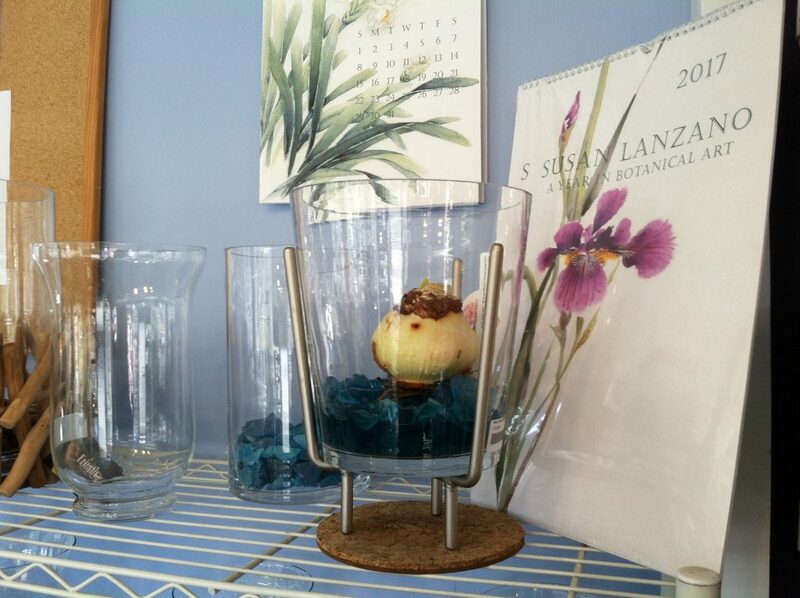 For forcing amaryllis and other bulbs, the store is showcasing a variety of glass vessels including vases and hurricanes, for just that purpose. Our staff members will be happy to answer any questions you have about forcing bulbs. 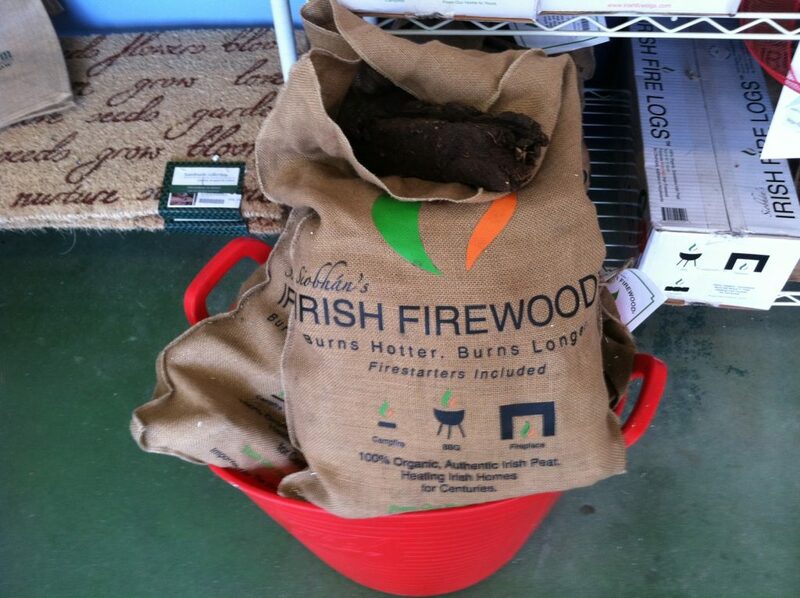 To keep the yule log burning at your house, consider our Irish Firewood, which is made from 100% organic, authentic Irish peat. If you’d like to get a start on your holiday shopping, we’re offering a range of gifts to suit gardeners and non-gardeners alike. In addition to the items mentioned above, choose from among our durable, top grade garden tools, lovely houseplants, hummingbird feeders, birdhouses, field guides, stationery, and wall calendars. Enjoy your ride along the country lanes amid fall’s splendor. We look forward to seeing you at the store. There’s a Whole Lot Happening at the White Flower Farm Store! 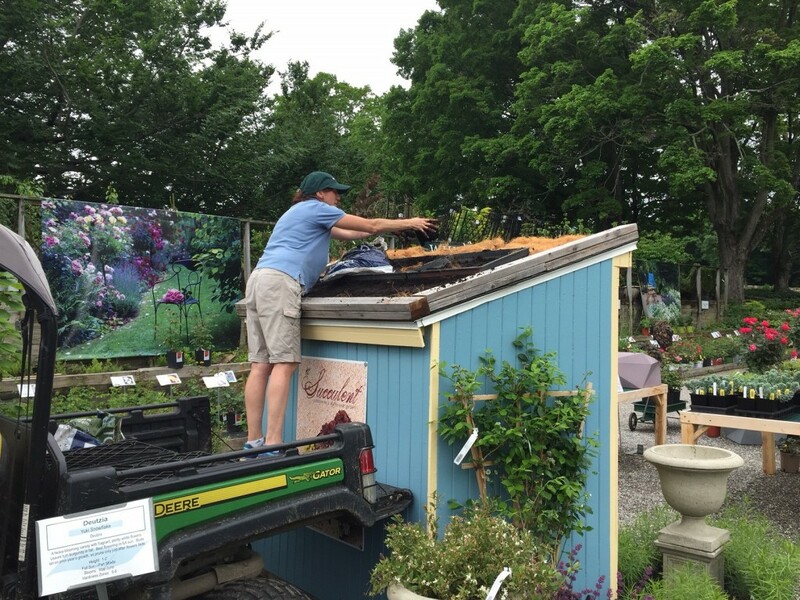 The store’s Visual Merchandizer Mary Valente installing Sedum Tile(R) Color Splash on the roof of the display. 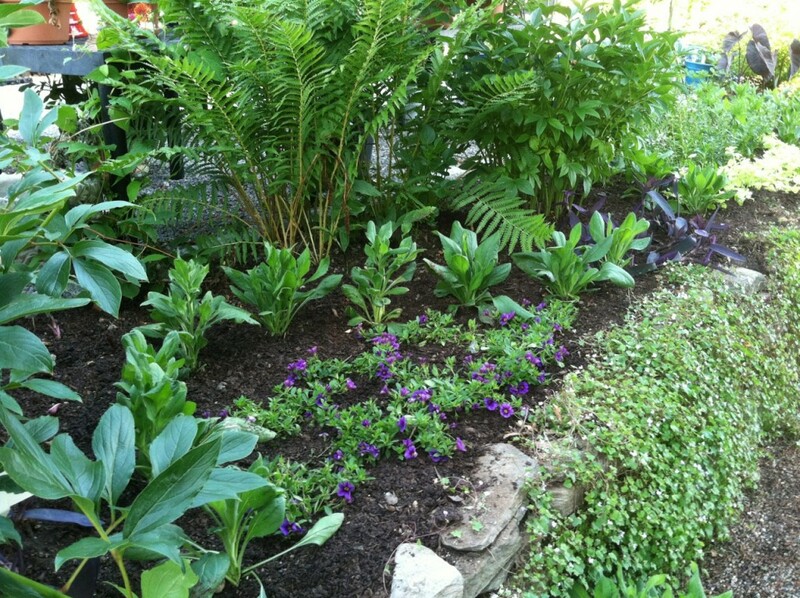 New residents of the sunny bed at the store include purple-flowering calibrachoa, Ostrich Fern, herbaceous peonies and tradescantia. Changes brought about by the renovation of the store earlier this year have inspired other displays. As part of the renovation, we demolished the Lathe House, an aged wooden structure that had for decades served as a display space for shade plants. A long garden bed bordering the Lathe House had once been largely shaded by the structure, but with demolition complete, the bed was suddenly blasted with sun. Established stands of hosta, astilbe, and ferns were baking and had to be removed and replaced with sun-loving plants. Under the direction of Store Manager Tom Bodnar, store staff members got to work. They removed the mature shade plants (relocating many to other parts of the display gardens), and in their place, they created colorful combinations of annuals and perennials. Where once astilbe grew, the purple groundcover Tradescantia ‘Purple Queen’ plays beautifully with silvery Artemisia ‘Parfum d’Ethiopia’ and the felted, cascading, lime-colored leaves of Helichrysum ‘Lemon Licorice.’ In another spot, a purple-flowering Calibrachoa, Rudbeckia ‘Prairie Sun,’ and Tradescantia ‘Purple Queen’ combine to make a lovely trio. The lush, towering Ostrich Fern (Matteuccia struthiopteris) got to stay because, although it’s typically considered a perennial for part shade, it will tolerate full sun if the soil stays moist. The herbaceous peonies also stayed in place, acting as bookends for the new arrivals. Dahlia ‘Fascination’ at the Store. This being the start of July, the store is loaded with potted dahlias, a glorious array that’s adding brilliant color to store displays and will do the same on your patio or in your gardens. These stars of the late summer and autumn garden send up abundant blossoms from now until hard frost. As welcome as they are in sunny gardens, they also make outstanding cut flowers. All around the store, the hydrangeas have exploded into bloom. Our broad selection includes macrophyllas, lacecaps, climbers, and mountain, arborescens and oakleaf varieties in colors ranging from pistachio to pink to white, and seaside blue to rich purple. In recent years, the development of compact hydrangea selections means there are plenty of options for every landscape and garden with sizes ranging from compact container-scaled shrubs to 8’ plants that make glorious privacy hedges. Hydrangeas bloom over a long period that starts in summer and carries the garden through to fall, and this makes them a tremendous asset in any border or yard. 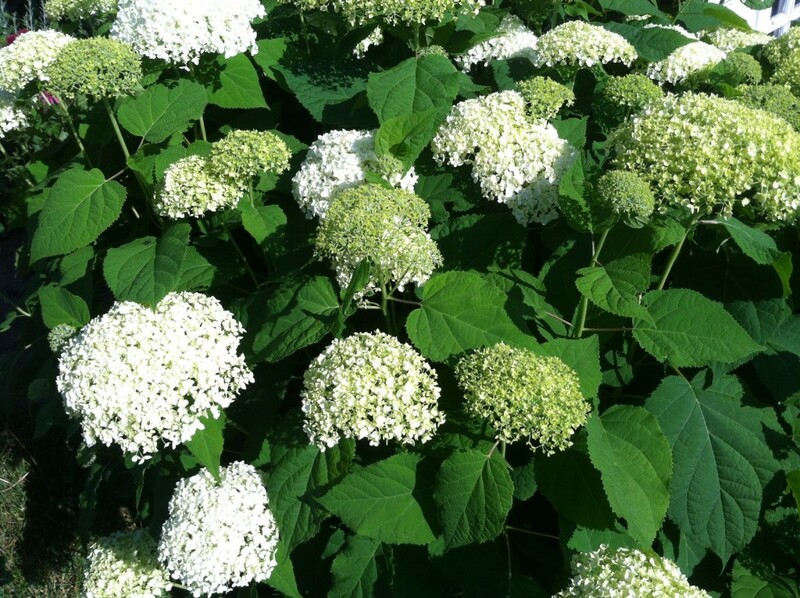 For those wishing to know more about these long-blooming shrubs, Store Manager Tom Bodnar will give his 2nd Annual Hydrangea Garden Talk & Tour on July 2nd at 10 a.m. New this year, the event includes a Flower Arrangement Demonstration by one of our staff members. If your garden is flagging a bit in the summer heat, visit the store to see a range of ideas for adding color to your beds and borders. Helenium, Heliopsis, Rudbeckia, Echinacea, Summer Phlox, Sedum, Ornamental Grasses, Dahlias, Daylilies, and Hibiscus all add color, texture and vitality to gardens from high summer to fall. How would you use this basket? Sometimes when we’re considering adding new products to our list of offerings, we ask customers for a bit of help. The basket shown here is one such item. It’s on offer now at the store where we’re conducting a raffle. 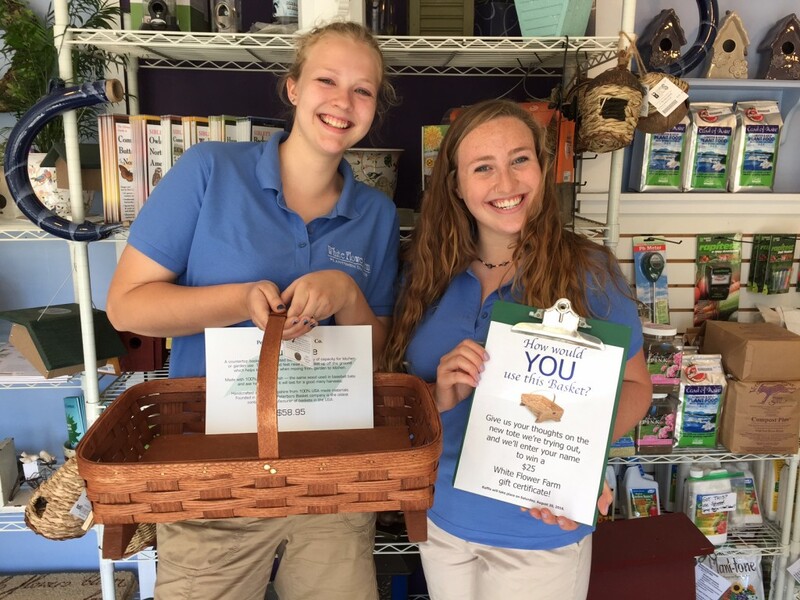 Drop by, tell us how you would use the basket, and we’ll enter your name to win a $25 gift certificate to White Flower Farm. 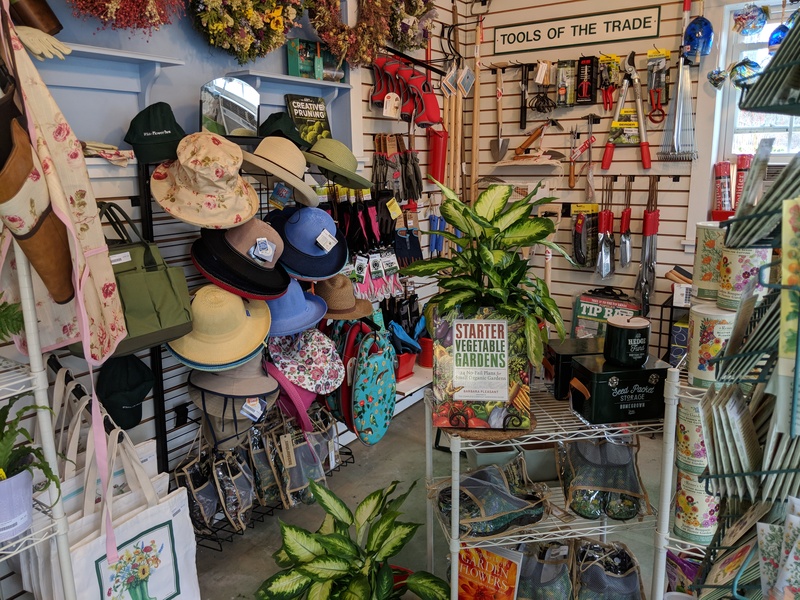 While you’re visiting, you can see how the staff at the farm uses any number of the products we sell – from garden tools and watering cans to sun-shielding hats and gloves, and, of course, in our display gardens, you can see how we use a broad selection of plants, shrubs and trees. The Lloyd Border at White Flower Farm. 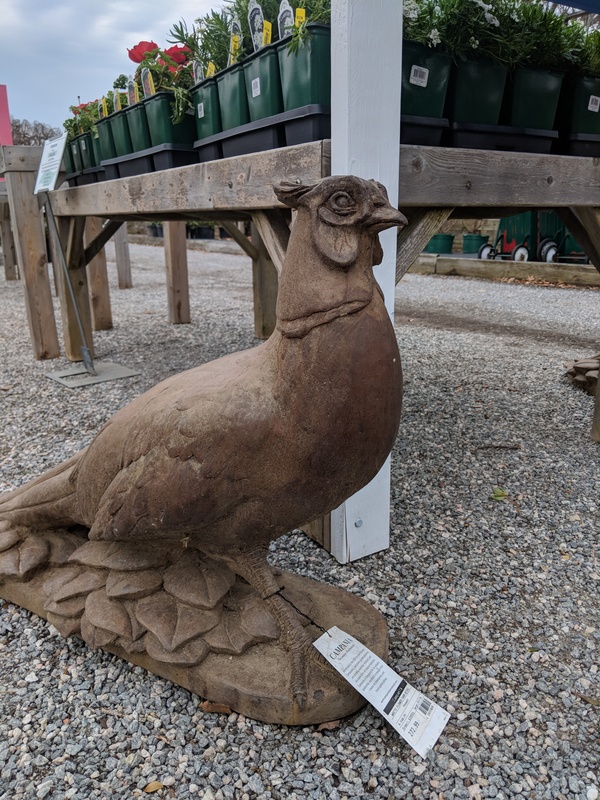 Sometime during this garden season, we hope you’ll visit our display gardens in the Morris section of Litchfield, Connecticut. Depending on the timing of your visit (or visits), you’ll find plenty of blooms in our outdoor borders, and quite possibly, in the Begonia House, which is generally in peak bloom from July to September. We also offer a variety of events each year, and you might consider planning your visit around those. Our 11th annual Great Tomato Celebration takes place May 20th–22nd at the farm, and our annual Open House will be held June 18th. 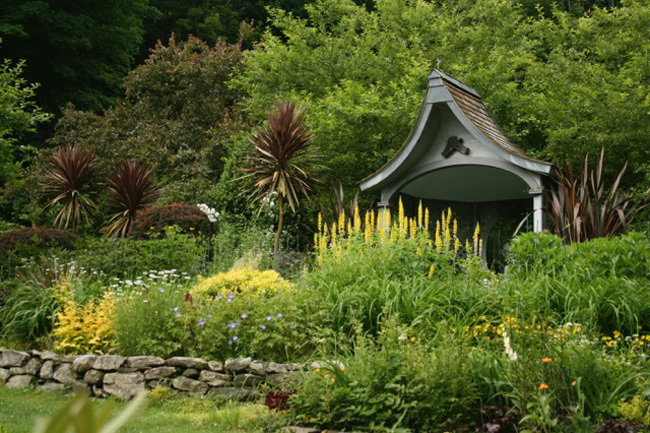 Brush Hill Gardens in Washington, CT, will be open June 18th as part of a full day of Open Days garden tours. Photo by Barbara Paul Robinson. The mission of this highly regarded national organization is “to save and share America’s outstanding gardens for generations to come.” Since 1989, the conservancy has worked to ensure the survival of more than 100 gardens across the United States, and to promote gardens and gardening. In addition to lectures, garden-study opportunities, and other events, it hosts annual regional garden tours called Open Days. Whether you visit a single site or multiple ones, viewing gardens of all types and sizes is a terrific way to absorb and appreciate fundamentals of garden design, glean tips on what to plant, and come away inspired to try new ideas. In our neck of the woods, the 2016 Litchfield County Open Days are: June 11 and 18, July 9 and 30, August 28, and September 11. 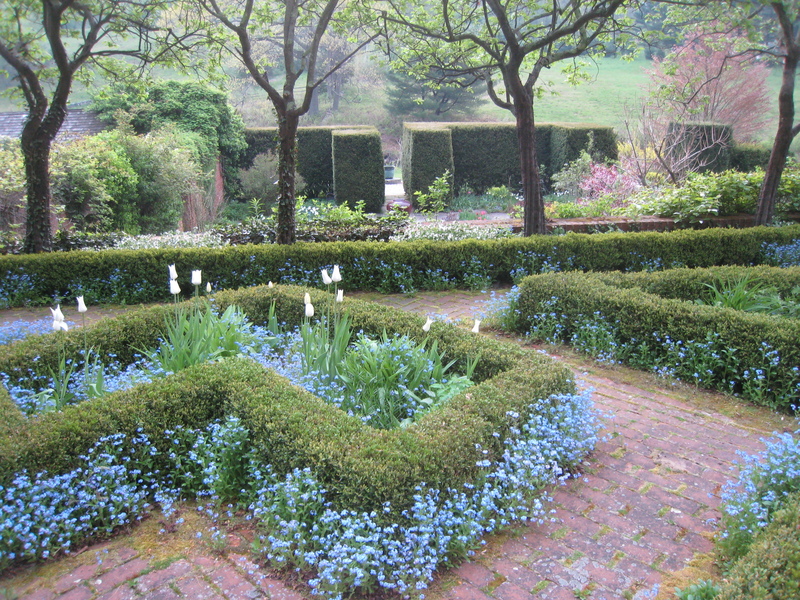 For a complete calendar of Open Days garden tours in Connecticut and across the United States, and to learn more about this organization, visit www.gardenconservancy.org. The first day of every Trade Secrets event features a Rare Plant and Garden Antiques Sale held at LionRock Farm in Sharon, CT.
Martha Stewart keeps the annual Trade Secrets event on her calendar. 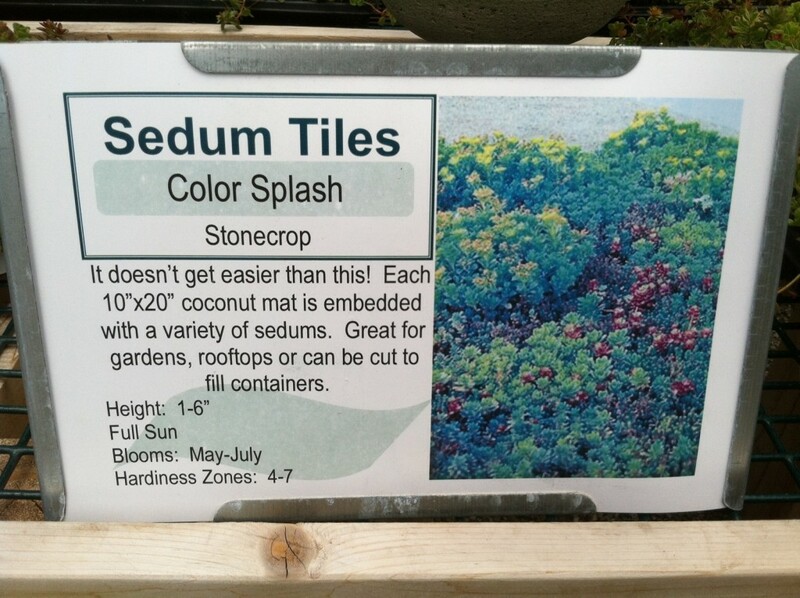 “Growing With Plants” blogger Matt Mattus has made the trip from Massachusetts. And, speaking for ourselves, we wouldn’t miss it. 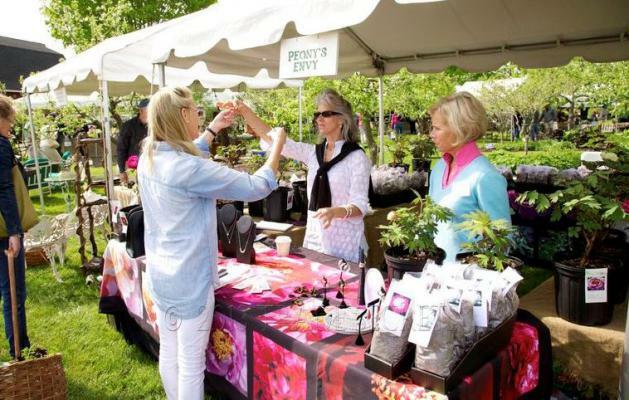 The two-day event features a garden market on the first day and self-guided tours of several private gardens on the second. This year’s event will be held May 14 & 15. Saturday brings the Trade Secrets Rare Plant and Garden Antiques Sale at the hilltop LionRock Farm in Sharon, CT. On Sunday, drive yourself around the hills of northwest Connecticut, stopping to visit four different gardens between 10 a.m. and 4 p.m. The gardens you’ll see this year belong to: internationally known interior designer and Trade Secrets founder Bunny Williams and her husband John Roselli; author, and lifestyle and fashion icon Carolyne Roehm, whose garden is called “Weatherstone”; Pat and Judy Murphy of “Old Farm Nursery”; and antiques dealer, and interior and landscape designer Michael Trapp, whose home garden is rarely open to the public. The Trade Secrets event is a fundraiser for Women’s Support Services of the northwest corner of Connecticut. For more information about Trade Secrets and to buy advance tickets, visit www.tradesecretsct.com. Spring arrives in the Grey Garden at Hollister House Garden in Washington, CT. Inspired by some of England’s great gardens – Sissinghurst, Great Dixter and Hidcote – Hollister House Garden is an American interpretation of those classics. Situated on 25 acres in Washington, CT, it was begun in 1979 by George Schoellkopf and Ron Johnson. Schoellkopf’s 18th century house is surrounded by a succession of garden “rooms” that are separated by stonewalls and hedges, and decorated with a glorious abundance of plantings. Equal parts formal and informal, classic and wild, it’s a marvelous place to stroll and learn. Hollister House also hosts a series of events each season, and this year’s lineup is superb. 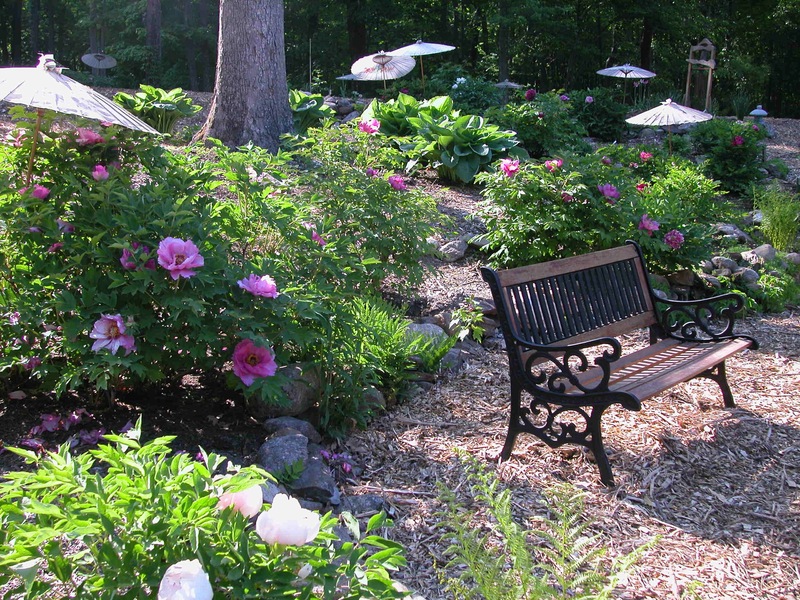 Umbrellas shade the glorious peony blossoms at Cricket Hill Garden in Thomaston, CT. 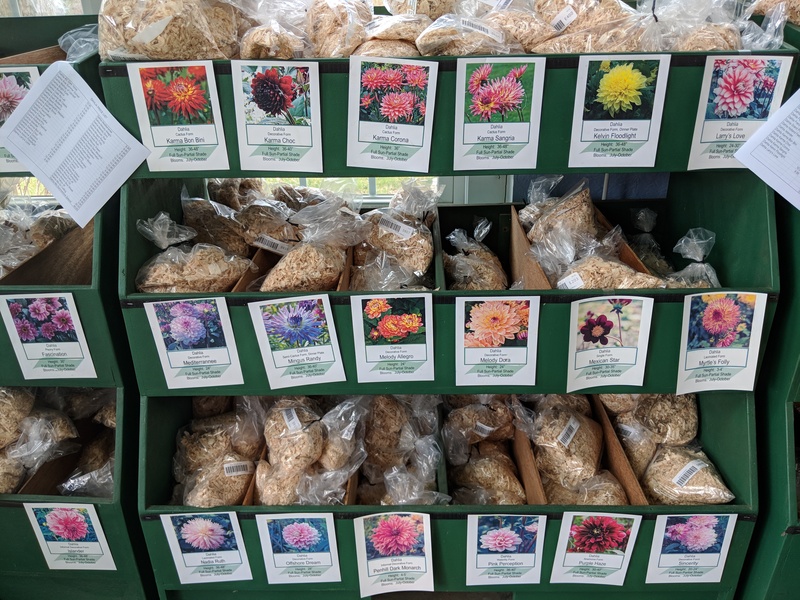 Otherwise known as “Peony Heaven,” this specialty plant nursery in Thomaston, CT, grows and sells rare and unusual peonies (including herbaceous, tree and intersectional varieties). If you manage to make your visit during blossoming time, you’ll understand where the “Peony Heaven” nickname comes from. Founded in 1989, the nursery is run by members of the Furman family. It also specializes in perennial landscape edibles including Asian Pear, Pawpaw, Persimmon, Elderberry, Mulberry, and heirloom and other Apples, among other treasures. Visit Cricket Hill online at www.treepeony.com, or in person. Cricket Hill’s 27th Annual Peony Festival is timed for the weeks of peak bloom in the peony gardens. This year, it’s slated for early to mid-May for tree peonies and mid- to late May for herbaceous and intersectional varieties. Before driving, call the number above for blossom updates. Built in two stages between 1754 ad 1767 by the Rev. Joseph Bellamy, this home became a gardener’s paradise beginning in 1912 when it was purchased by Henry and Eliza Ferriday. It was Mrs. Ferriday who began designing the outdoor spaces, creating a formal parterre garden, planting fragrant perennials, shrubs and trees, and utilizing evergreens to screen the house from the adjacent roadway. When Mrs. Ferriday died, daughter, Caroline, took over ownership of the property. In addition to her work as an actress, philanthropist, and conservationist, Caroline continued her mother’s work in the garden. Today, the gardens are a treat for those who love lilacs, peonies and historic roses, as well as flowering trees and shrubs. Tours of the house and gardens are offered from May to early October. The home is considered a Connecticut landmark, and it’s included on the register of National Historic Places. For more information, visit www.ctlandmarks.org/bellamy-ferriday. After weeks of unseasonably warm weather here in Morris, CT, the White Flower Farm Store opened Monday, March 21, just in time for what we hope was the last snowstorm of the season. We were spared the worst, and the dusting of snow (which, we confess, looked absolutely beautiful on trees and shrubs), melted away before noon. Adromeda ‘Brouwer’s Beauty’ is ready to burst into bloom. 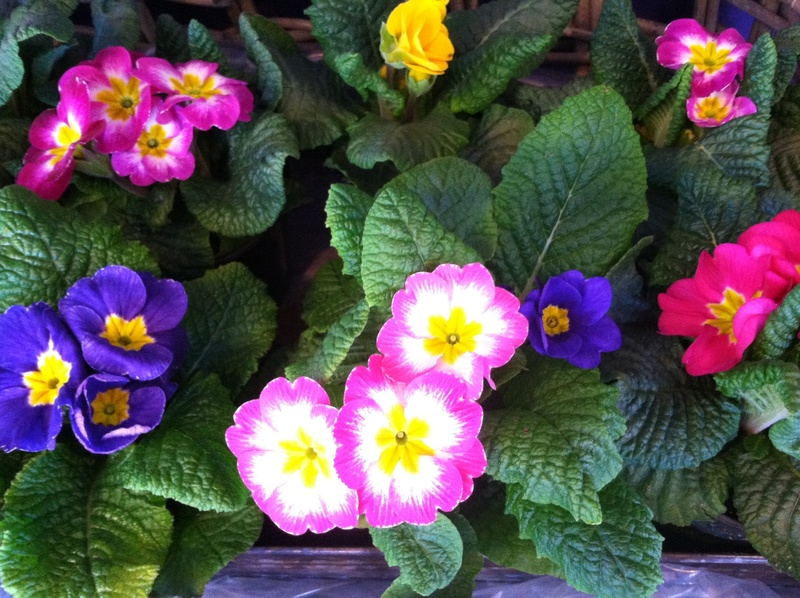 So, what’s on offer at our plant nursery at this time of year? Our remodeled, expanded display space has more room than ever for lovely spring-flowering trees (most in landscape size, which means 5- to 15-gallon specimens), evergreen shrubs including the budded and blossoming Andromedas that are great for year-round structure and color, espaliered fruit trees that can be used to create living “fences” around or in a vegetable garden or soften the existing walls of a home or shed, and container pots that add interest and color to porches and patios. While here, be sure to see our selections of berry plants as well. We offer three types of Grape vines, numerous Blueberries, and at least four different Raspberry selections, all of which will have you harvesting delicious fresh fruit from your garden. 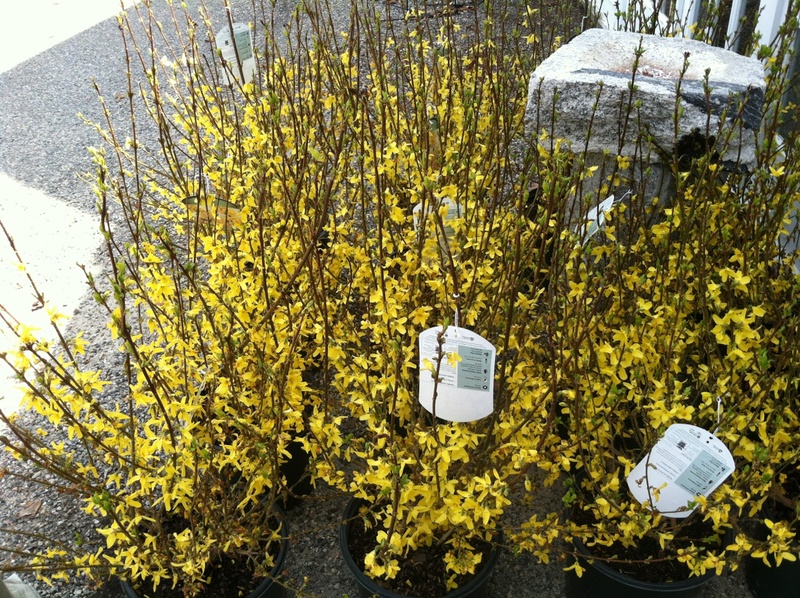 As you peruse our selection of trees and shrubs, bear in mind that we now offer delivery service. If you purchase plants at our Morris store, we’ll be happy to deliver a van full for a small fee. We also offer tree-planting services for a nominal fee for any tree purchased at our nursery. Ask one of our staff members for details. 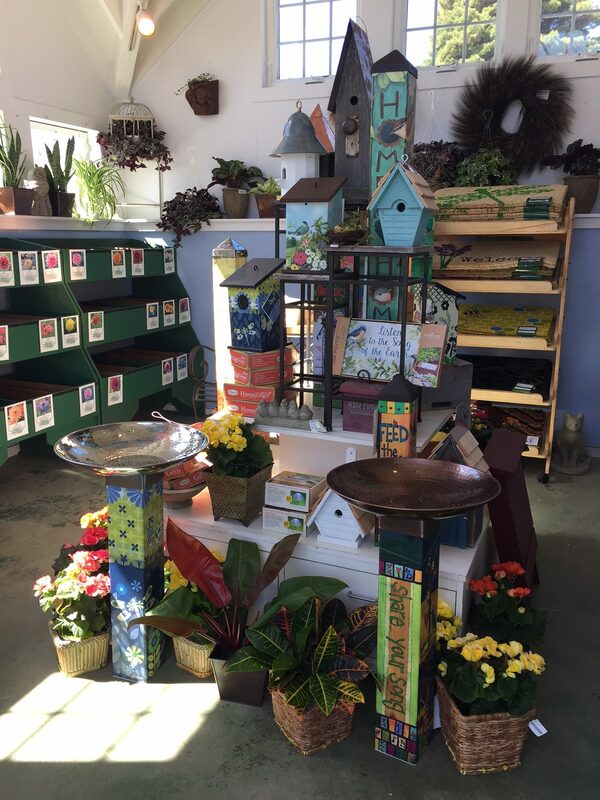 Inside our freshly painted store, we’re welcoming the new season with a wide array of plants, gardening supplies, and gifts. The African Violets are particularly beautiful this year, their colors ranging from rich purple and deep pink to bicolor. 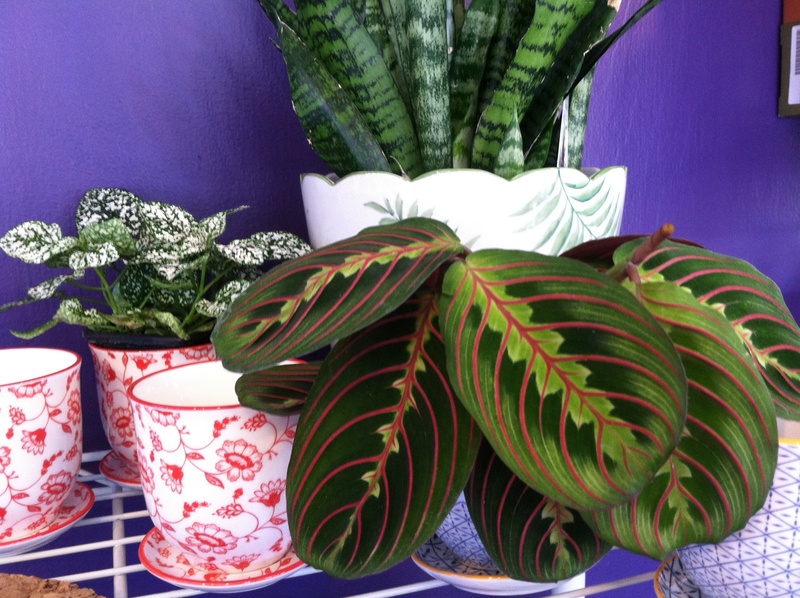 They look marvelous alone or displayed with foliage plants. Many are available in tiny teacup-sized cachepots that would look just right on a desktop or bedside table. 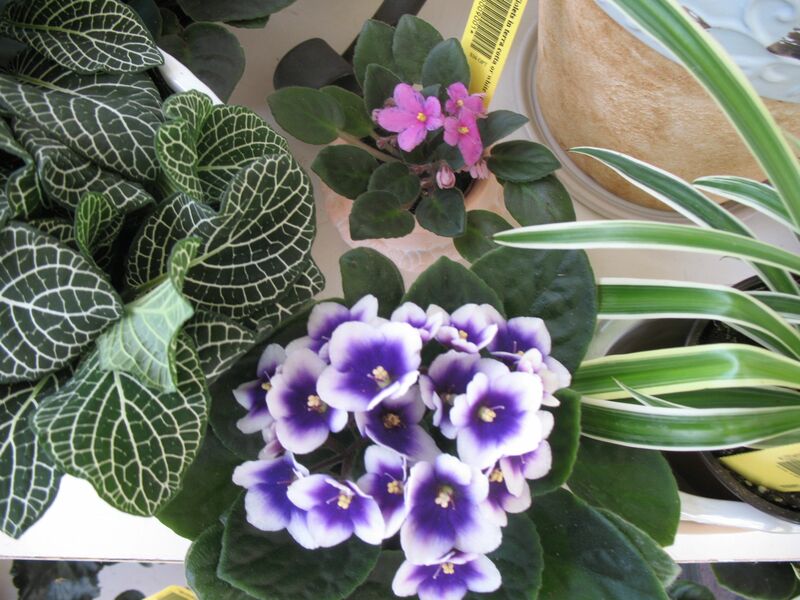 Distinctive flowering and foliage houseplants are a great gift or table decoration for the upcoming holidays. A teak wood bowl is filled with a variety of different Air Plants. 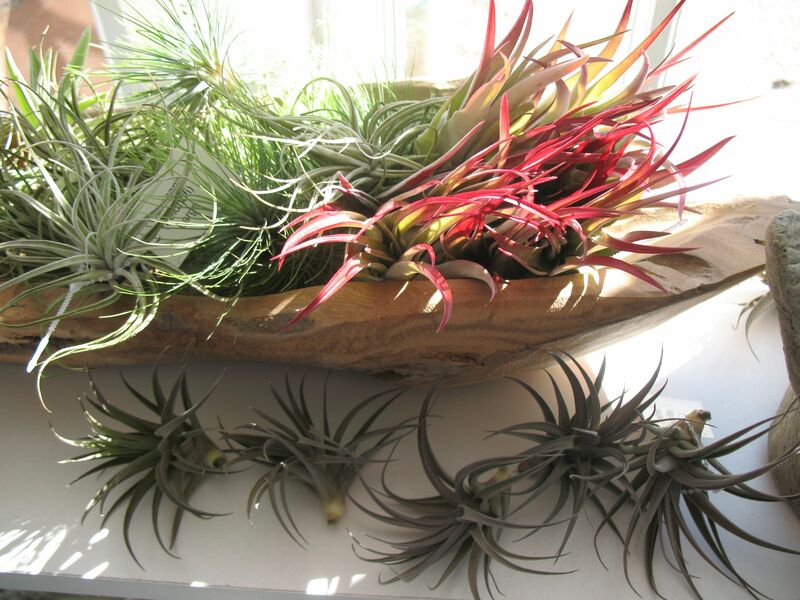 We’re offering a broad selection of beguiling Air Plants (Tillandsias), which subsist on nutrients in the air and the occasional spritz of water. 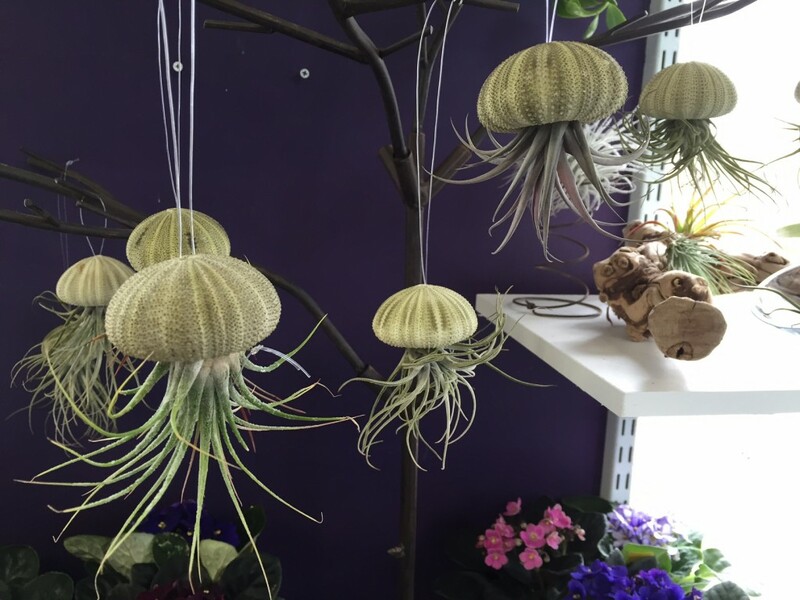 Mary Valente, visual merchandiser and gift buyer for the White Flower Farm Store, is showing them suspended from the ceiling on fishing line, overfilling teak bowls, and tucked into displays here and there. 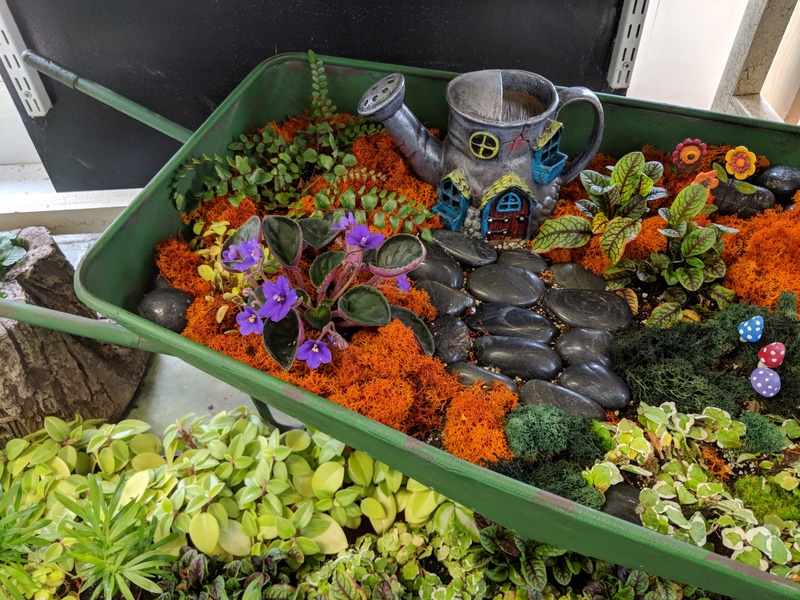 Fans of miniature gardens will find supplies aplenty – from miniature plants to miniature props – for creating tiny, highly personalized gardens under glass. 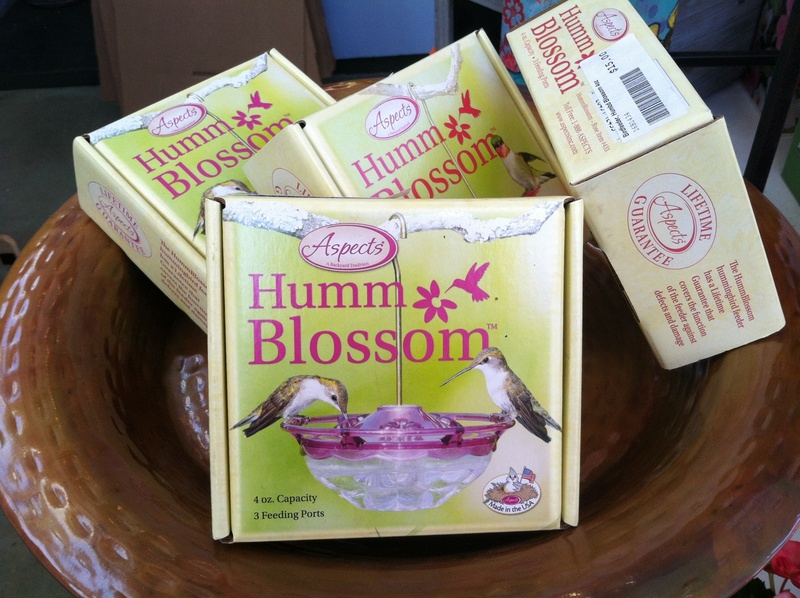 Mary Valente, visual merchandiser and gift buyer for the White Flower Farm Store, loves this seed blend, which attracts hummingbirds. 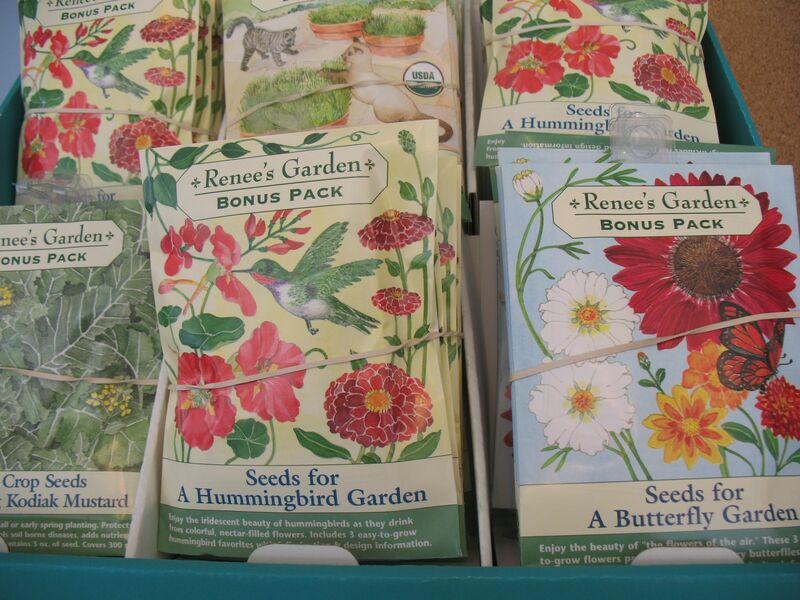 For those who enjoy starting their own seeds, we’re offering a broad selection of packets for individual flowers and edibles (the majority organic), plus seed collections, including some that attract hummingbirds and pollinators. 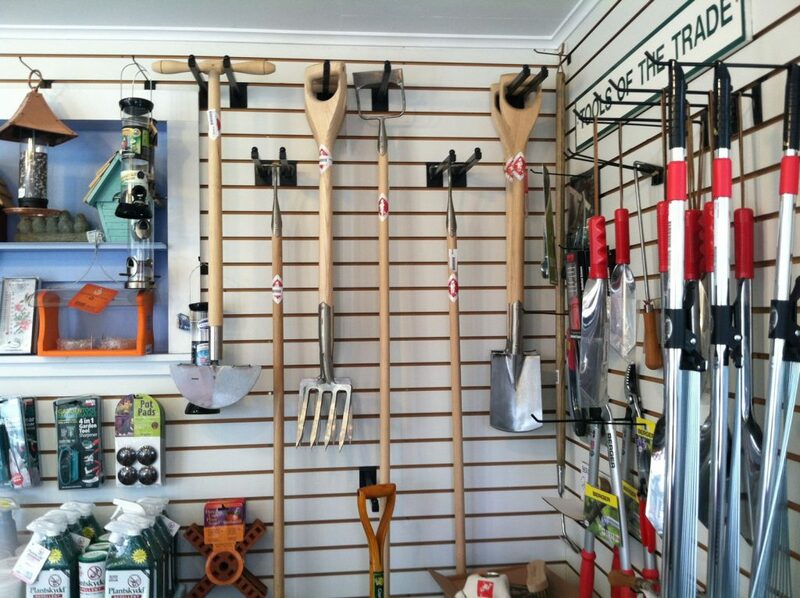 All the tools we offer are put to the test at the farm. These are some of the best. 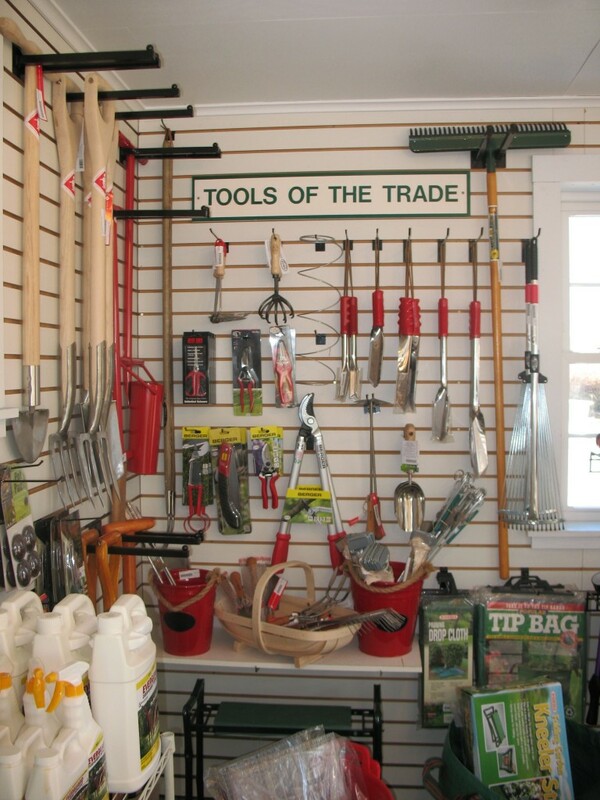 In our Tools of the Trade section, we’re showcasing a selection of the professional-grade garden gear we use at the farm, along with the garden supplies we deem essential – from Tomato ties and blossom-boosting fertilizer to deer and rabbit repellent. What else? There are bird feeders (including a new hummingbird feeder that invites hard-working flyers to perch on a raised rail as they feed), birdhouses, Lily bulbs, (the Dahlia tubers are arriving soon), stationery, postcards, garden hats, and glass hummingbird ornaments that, hung near a window, sparkle in the light. Sometimes, we all need a little lift. 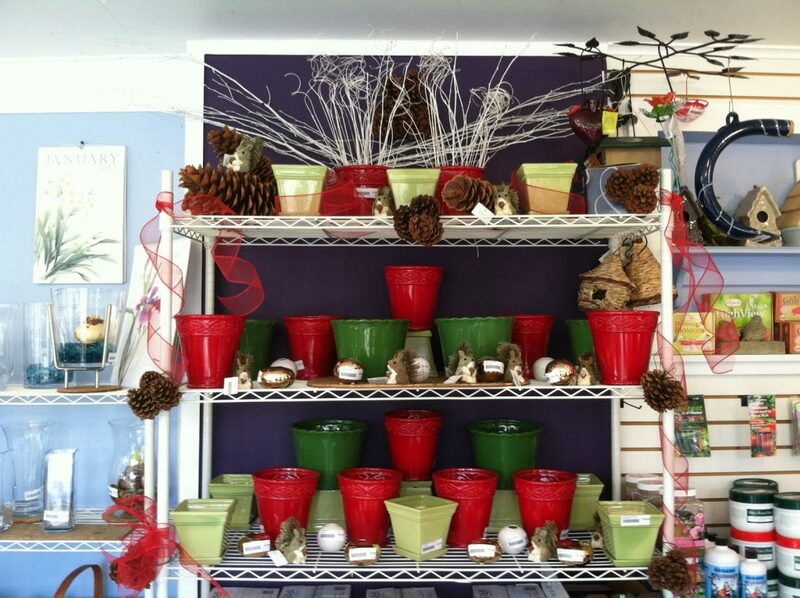 When we closed the White Flower Farm Store for the season last November, it was clear it was time for a makeover. The dwarf conifer hedge was dwarf no more and was threatening to burst through a retaining wall. The hedge was also blocking views to the display gardens. After 30 years, it was time for a major makeover. The Lathe House, known to customers as the “shade pergola,” had begun to lean after 30 years of sterling service. Perhaps most importantly, in the years since the store was built in the early 1950s, customers’ buying habits had changed along with the depth, breadth and variety of plants and other merchandise we carry. To allow us more room for display, and to give gardeners of all skill levels the ability to shop more comfortably and more easily, we deemed it time to make some big changes. 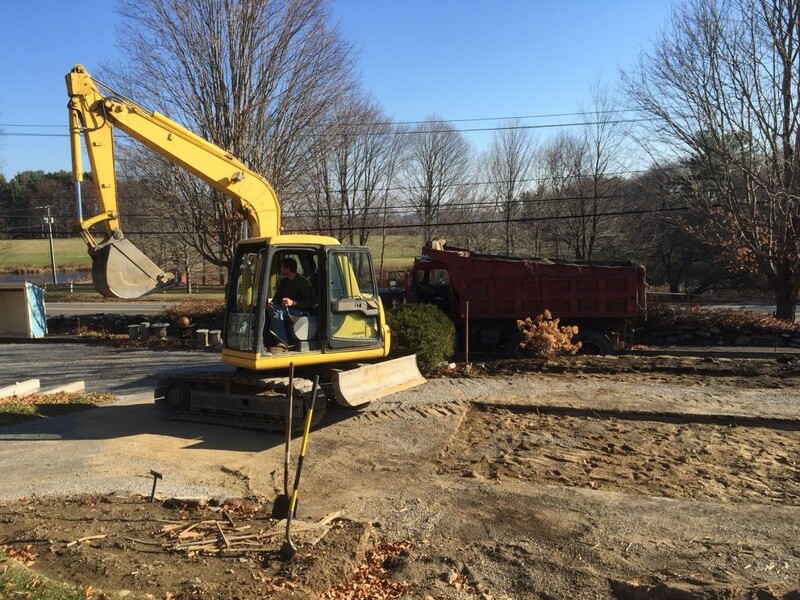 We took advantage of the extraordinarily mild winter to do some major regrading to create more display space. Our owner Eliot Wadsworth, property manager Tom Anctil, and store manager Tom Bodnar led the charge, devising plans for the dramatic renovation. The evergreen hedge was removed in late summer. After the store closed for the season on Nov. 15, the demolition phase began. The Lathe House was toppled and cleared away. 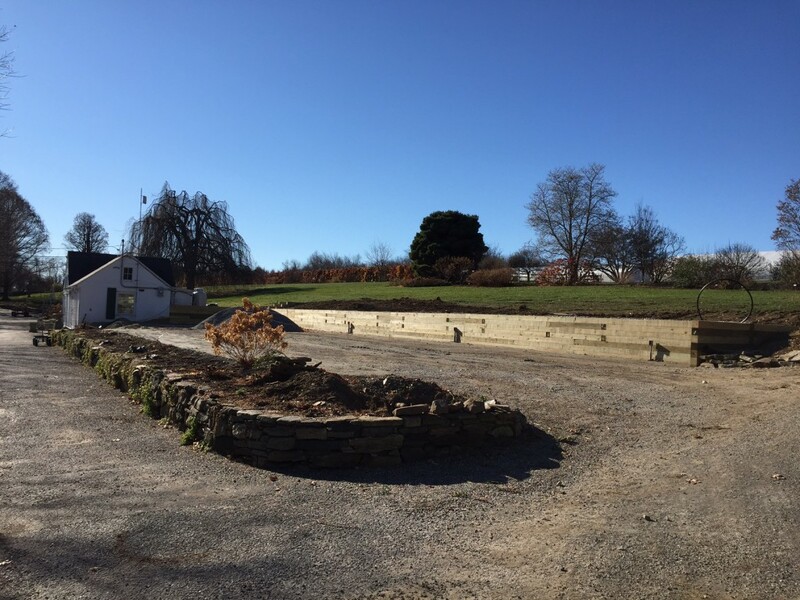 The 600 square feet of grass between it and the store was re-graded, and a new retaining wall was expanded and built. Stairs were added to ease access from the store to the display gardens. Two propane tanks were relocated to create a new storage area, and new windows were installed on the store’s west side. 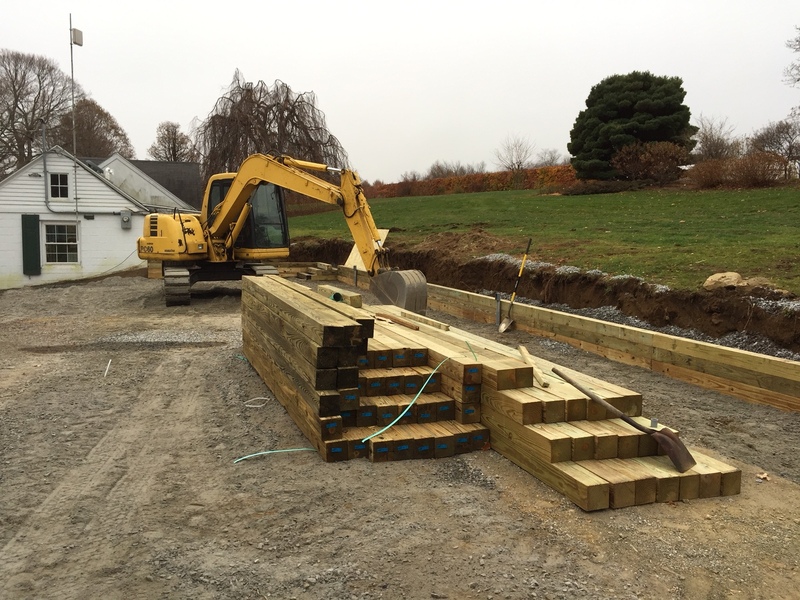 Renovation plans included the construction of a new retaining wall. Come spring, we’ll be showing off the results of our efforts. Among the new display areas, there will be vignettes designed to show customers how plants can work in their home landscapes. We’ll have more signage, more garden décor items, and more suggestions for incorporating plants into patio and other outdoor living areas. We’ll still display perennials alphabetically by name, but we’ll be showing others by theme such as deer-resistant plants, pollinator favorites, and plants by blossom color. With more room for merchandise and merchandising, we’ll expand our offerings and have more room to introduce new finds. In the space where the lathe house used to be, we’ve created a new area for themed displays including deer-resistant, pollinator friendly, and color-themed plantings. As spring draws near in the coming months and the store gets fully stocked for the new season, we’ll be posting plenty of photos of the remodeled space. The store always opens its doors by early April (the exact date depends on the weather). We hope you’ll come by for a visit and stay awhile to meander around. Perhaps our changes will inspire you to make some of your own.